Hello Loves. I have another Bio Seaweed Gel wear test to share with you today, along with a swatch of Pina Colada from the 3 step line. 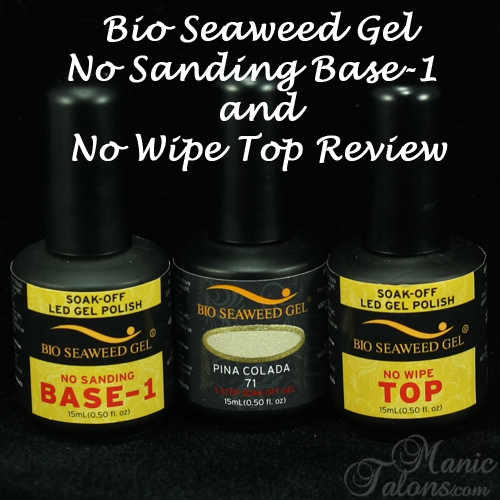 This time, I tested the Bio Seaweed Gel No Wipe Top Coat and the No Sanding Base-1. This base is designed for weak or damaged nails. Shall we start with the swatch of Pina Colada? Pina Colada is from the 3-step line. Unlike the Unity line, the 3-step line does require a base a top coat. Pina Colada is a dense glitter polish with various sizes of champagne and gold holographic glitter in a clear base. I found this one to be opaque in 2-3 coats, which is nice for a glitter! Let's talk about the No Wipe Top Coat. This product really impressed me! In my experience, no wipe gels tends to lack that mirror shine that I love so much about gel polish top coats. That is not the case with this one. The BSG No Wipe Top Coat provided tons of shine that didn't dull out over the course of normal wear. The top coat itself is not too thick or thin, applies easily and levels well. Want to see it? This is one coat over BSG Unity Gel in Celebration. Look at the reflection of the light on the index finger. You can see the swirl of the compact florescent bulb and the shade to the lamp! That's some serious shine. The only down side is that it does require a 1 minute cure in LED, but that's a fair trade in my opinion for not having to deal with the tacky layer. It is especially huge for me since I go through more polish changes than the average person and alcohol is very drying to my skin. Let's talk about the No Sanding Base-1. This base coat is specifically designed for weak or damaged nails. While my nails are neither weak or damaged, I think I was able to give it a fair review since my nails have been "buffed" to remove the shine for previous wear tests. The base is average thickness and easy to apply. There's not much more to say about application. So, how about removal? This is where the No Sanding Base-1 let me down. For a base designed for weak or damaged nails, I was expecting a gentle and easy removal. That's not what I experienced at all. After breaking the seal from the top coat, I soaked in pure acetone for 10 minutes. This is what I saw when I removed the wraps. The No Wipe Top Coat soaked off very well but the color coats and base coat are still completely intact. After soaking for another 10 minutes, the gel had softened but was not flaking off at all. The following photo is the result after gently scraping the softened gel off of my nails. As you can see, most of the color came off but the base is still there. I soaked for another 10 minutes (30 minutes total at this point) and was able to push the rest of the gel off of my nails with the exception of one spot on my ring finger (the lighter spot toward the center of the tip of the nail). I ended up having to buff the gel off of that spot. To be completely honest, I'm a bit disappointed in the removal of this base. There is way too much risk for additional damage when you have to scrape and buff to remove the product from the nail. If my nails were weak or damaged prior to application, I can only imagine what they would have looked like after removal. Final thoughts? I adore the No Wipe Top Coat and will keep it in my gel polish arsenal. This stuff rocks! As for the No Sanding Base-1 for weak or damaged nails...I'm going to have to pass. I honestly feel like the regular No Sanding Base that I reviewed here was easier to remove. The colors, however, are quite beautiful and I adore Pina Colada and it's opaque glitter coverage. *The products featured in this post were provided by Bio Seaweed Gel for my honest review. Mmm . . . Love the glitter, and that purple is growing on me . . .